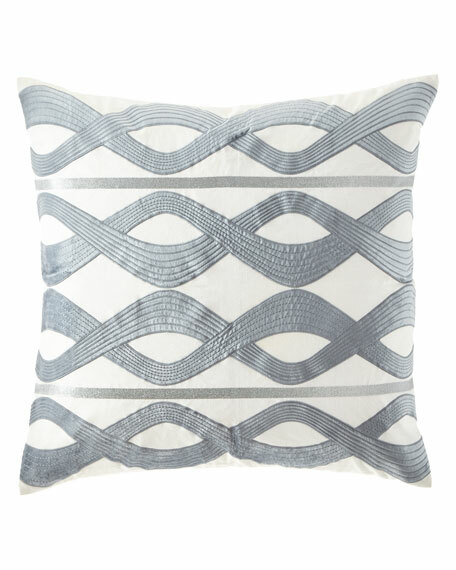 Decorative pillow with wave pattern. EXCLUSIVELY AT NEIMAN MARCUS Diamond sham with solid shirred welt. Solid chenille backing. Zip closure. Main: polyester/rayon. Backing: cotton. Trims: polyester. Dry clean. 26"Sq. Made in the USA of imported materials. EXCLUSIVELY AT NEIMAN MARCUS Jacquard sham with 3" diamond mitered flange and cord finish. Two-piece diamond back with zip closure. EXCLUSIVELY AT NEIMAN MARCUS Jacquard sham with 3" diamond mitered flange and cord finish. Two-piece diamond back with zip closure. Main: polyester/rayon. Backing: cotton. Trims: polyester. Dry clean. 26"Sq. Made in the USA of imported materials.